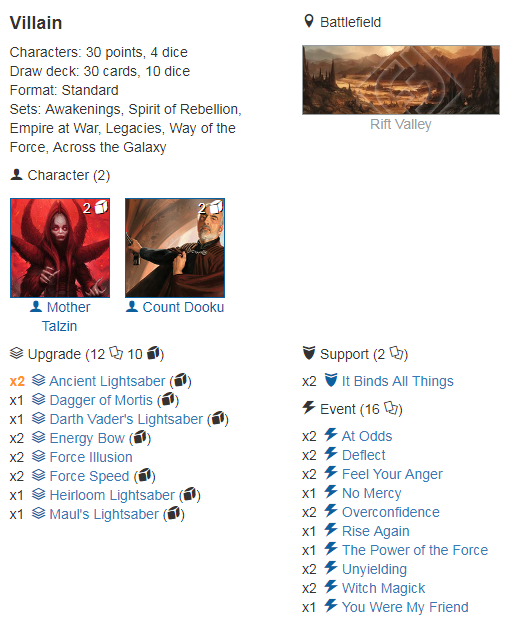 In the weeks leading up to the regional I was leaning towards playing Dooku/Talzin (I used them to win Season 8 of the Artificery league, which had decklists locked in a little over a month ago) and seeing Dooku/Talzin win two regionals the weekend prior to my event sealed the deal. The top three regional winning decks so far were Vader/Greedo, Yoda/Leia mill and Tarkin/Snoke, and I like Dooku/Talzin against all of them. Vader/Greedo – I feel like a favorite in this match up, though not a heavy one. Dooku’s ability is very good at keeping Vader off of Friends in High Places, and in my experience, I will win when Vader can’t play it (or if he whiffs when he does). Be patient with Dooku. If your opponent is showing damage on one Vader die, but not showing 7 total, don’t flip it. Just let him have it and make him play fair. If he starts rerolling, you know he’s looking for 7, and flip his highest die when he does get there. When Vader wins the roll off, he will always take Theed, and when I win, I’ll always give him Theed. Do your best to take Theed from him going into round 2 and keep it the rest of the game. With Talzin having two shields Dooku becomes Vader’s target, and I much prefer racing to 15 damage while my opponent tries to get to 12, than trying to get to 17 while Vader only needs to get to 9. Beating Vader is the number one priority, so if you can’t do it, don’t even bother bringing the deck (I’m looking at you Tarkin/Snoke). Leia/Yoda – Dooku/Talzin is very strong into mill as it combines the two things mill hates most, god rolls (through their abilities) and action cheating. Dooku/Talzin is especially strong vs. Leia/Yoda as you can burst Leia down fast, and you don’t care about cards being ripped from your hand, as you were never going to play more than two of them anyways and don’t need a lot of rerolls. Just play your upgrades and roll into great natural damage. At Odds is great vs. mill and The Power of the Force is a blow out card into them as well. Ancient Lightsabers don’t hurt here either. Tarkin/Snoke – Give them Theed and just blast Tarkin down as fast as you can. With 2 Deflect and 2 At Odds, you aren’t overly scared of Fist since they have to pay for it, unlike with Vader. 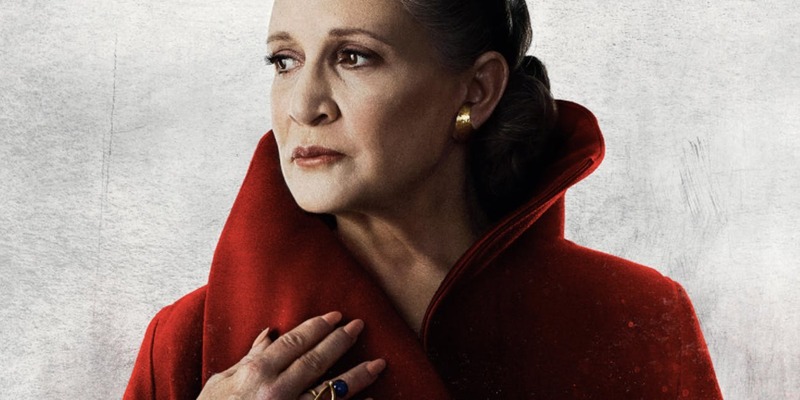 As with Leia/Yoda, you don’t care if Tarkin rips your hand away, you have plenty of consistency and it deals damage to your target while removing his own die and shutting off Snoke’s power action. When your opponent Snoke’s Tarkin’s double discard side, you know you’re going to win. Snoke 3 Wide Decks – These might be the best decks out there, but without the results to back it up (only 2 regional wins), I wasn’t going to switch off of Dooku/Talzin because of them. This is Dooku/Talzin’s worst match up, particularly with Rebel Traitor (which I see as the stronger version) as you are never allowed to roll in Dooku off a Force Speed special. Playing on Rift Valley improves your odds against 3 wide Snoke a lot, which is why I chose that battlefield. 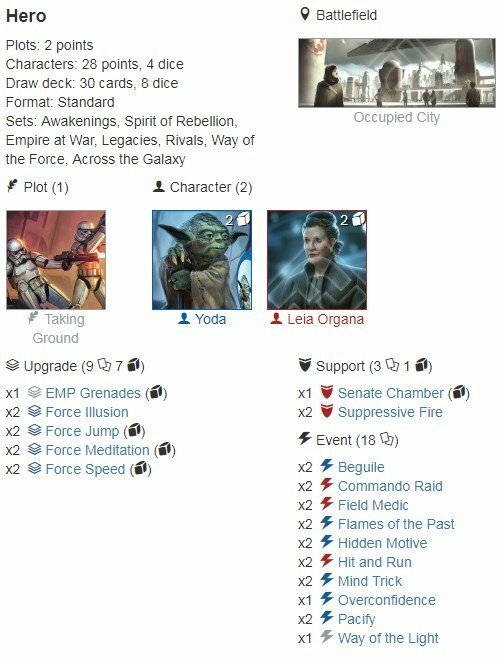 You’re 65% to win the roll off vs. these decks, and with the amount of work that Rift Valley can put in against Snoke’s focus sides, I think it’s a must to run Rift Valley over Theed. I was hoping to never see this across the table from me. Every even card must be explained, because they are costly to hit with Talzin’s ability and devastating when on Rift Valley. Force Speed is your best card (with Energy Bow a close second) and allows you to cheat in your Dooku activation and flip his die to provide fast devastating damage. Force Speed allows you to use high value modified dice to great effect as well, like Maul’s Lightsaber and Vader’s Lightsaber, since you know you’ll have a base side to resolve them. Ancient Lightsabers are amazing value, and I felt they were worth using despite being even. I think you could do without them as well though. No Mercy was included to give the deck some more reach to kill off a vital character faster, like Snoke in Snoke 3 wide decks, Tarkin in Tarkin/Snoke, etc. I only used it once over 11 games, so it probably wasn’t worth it. Despite being even it has some synergy with Talzin since you often only play 1 or 2 cards per turn anyways, so throwing your hand away is less costly. Unyielding is the 3rd best card in the deck. For those who have not used Dooku/Talzin before, it is a 2x auto-include. Play some games with it and you’ll soon see why. It can easily win you games that are otherwise unwinnable. I forgot it in the Artificery league and missed it badly. Rise Again is easy to get off with all the Theed’s running around, definitely want to include it. I think I played it 4/11 games. At Odds and Deflect are great vs. Vader’s Fist, so they’re easy 2x includes right now. The Lightsabers – I wouldn’t use more than 1 copy of any of the 3 cost Lightsabers, as you can turn on Flames of the Past. It may be correct to use Fifth Brother’s Lightsaber over Vader’s Lightsaber as you really shouldn’t be using Vader’s Lightsaber’s action unless you’re swimming in money, in which case you’re probably better off trying to Rise Again, or play a couple more cards that round. Maul’s Lightsaber is a different story, as it can be worth the resource and the actions to roll it in and resolve it if you’re confident your opponent has no mitigation. In any case, you should look at these Lightsaber actions as costing 3 resources and the initiative next round, as they will often cause you to lose Theed when taking the time to do them. I never used either Lightsaber’s action/power action all tournament. You want to hit Force Speeds and Energy Bows (which have 4 sides you’re thrilled to see) and hopefully a consistent piece of mitigation. Keep any even cards you find, as you do not want them in your deck. I wouldn’t bother keeping Binds when you don’t hit an Energy Bow or Ancient Lightsaber to go with it. It’s debatable when you get it with a Force Illusion, but even then I’d likely throw them both back and dig for Force Speed and Energy Bow. I rolled well and my opponent didn’t. I kept 2 deflects in my opening hand and was able to kill Iden round 2 before she resolved any dice (she rolled out poorly again that round). Iden and the baby blaster on her never showed a damage side this game. Rough game for my opponent. (1-0). My opponent and I both throw back all 5 cards for the mulligan, and I draw into an atrociously bad hand. I win the roll off and give my opponent Weapons Factory Alpha (which is stronger than Theed, but more niche so less prevalent), hoping that I can burst Thrawn down with the 2 damage head start from Bitter and no shields to protect him. My opponent calls 1, sees that I have no mitigation, Energy Bows or Force Speeds among my 6 card hand and takes a Binds from me. After resolving both Thrawn dice for 2 resources (1 with a Snoke power action) he’s off to the races, playing a Fist and a Tie round 1. This game was over before the first action was ever taken. L (1-1). Dooku Talzin is strong into mill, and this game went absolutely perfectly for me. I won the roll off (81% favourite) and took Rift Valley. I played Binds, my opponent played Force Jump on Yoda, I played Energy Bow, and he rolled into a blank on Jump, and discard on both Yoda dice. I play my second Energy Bow and after some thought, he takes my hand with Yoda’s dice and I roll in solid damage with both Talzin and Dooku. Round 2 starts with me dropping Force Speed and killing Yoda before he can resolve his dice, while also getting a 1 cost ancient down. This game was over very quickly, and with the draws I had and Yoda and Force Jump never showing specials there was nothing my opponent could have done. W (3-1). My dream of dodging Snoke 3 wide decks is over and I’ll have to beat one to make the cut to top 4. I win the roll off and take Rift Valley. 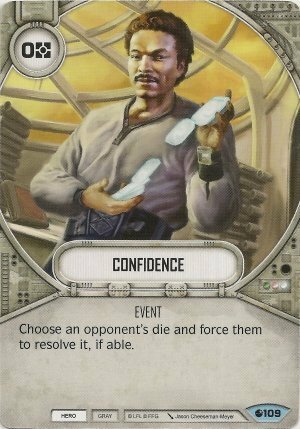 I’m able to control both Ciena and Bala’s dice round 1 and keep my opponent from getting any resources and put some damage into Snoke. He claims aggressively and misses on Rift. I learn round 2 that he was never intending to pay for anything straight up anyways, as he plays Delve to drop a Planetary Bombardment, then uses its die to play Friends in High Places into an AT-ST. I’m able to get Snoke to 9 damage and have a Deflect in hand and I’m praying that I can kill Snoke with the AT-ST die. I’m passing and he has every die in the pool except AT-ST and I’m worried he’s playing around Deflect, but he finally rolls in AT-ST and hits damage and I kill Snoke prior to any Snoke dice being resolved or his power action being used (I don’t think either of Bala or Ciena had naturally rolled resources). In the next round, I kill Ciena and he sinks a lot of damage into both Dooku and Talzin off his monster supports. Going into the final round, he has Bala with 2 shields and I have Talzin who’s about 3 away from death and Dooku maybe 5 away. He has the battlefield and rolls in Planetary (which basically can’t get a kill) instead of AT-ST (maybe playing around Deflect, but most likely just a mistake) and hits 5 indirect. I roll in Talzin and show some damage and a force speed special. He resolves the 5 indirect killing no one and I use the Force Speed special to roll in and kill Bala with Unyielding for 8, getting past the 2 shields and resolving my mixed damage sides all at once. I’m confident that if my opponent had played a little tighter, I lose that game (at one point he missed the optional trigger on Arc Caster to activate and reroll a die when rerolling one of my dice would have been important). By round 5 we’re all making some suboptimal plays, which I certainly did too this tournament, so I’m happy to get the win and move on to the top cut. W (4-1). I finish in 3rd with 1st going to a 5-0 Snoke Ciena Rebel Traitor. The Thrawn Snoke who beat me earlier finished 4-1, having only lost to 1st place, was in 2nd. A Vader/Greedo deck was in 4th, also at 4-1, and one unfortunate soul missed the cut at 4-1. Game 1 – Again my opponent and I discard all 5 cards and hard mulligan. I hit an Energy Bow, but not the Force Speed I was hoping for. He wins the roll off and chooses Weapons Factory Alpha, which he steam rolled me on last time after I chose it, and I draw Force Speed off the top of my deck with Bitter. The impact of this can’t be overstated, as I get my best card and avoid hitting an even on top of my deck. He calls 1 and chooses to take Feel Your Anger after hitting a blank on Thrawn and I get to play the Bow and Force Speed on Talzin turn 1 and this time I was the one off to the races. He got down a Droid Hailfire Tank, but without endless money to drop a stream of Ties, it’s simply an overcosted die and would be no match for my two characters doing what they do best. I kill Thrawn round 2 before he can resolve his dice and it doesn’t take long to finish Snoke. 1-0. Game 2 – My Opponent chooses Rift Valley this time and poetically Bitter moves me off an odd and onto an even. When you hit an even card on Rift Valley you’re probably going to lose as you get destroyed twice on that turn (Talzin and your claim both miss, unless you can use an Illusion to change the deck). I don’t remember too much of this game, as I pretty much knew I was done once that happened. I may have started with an Energy Bow, but definitely not Force Speed. 1-1. Game 3 – We’re back on Weapons Factory Alpha and I think I hit a Force Speed in my opening hand, if not I got it to round 2. For the 4th time in 4 games, my opponent hard mulligans (pretty sure it was 4/4, could have been 3/4). I have a very strong board state going into round 3 with Talzin having two Force Speeds and an Energy Bow on her and Dooku with an Ancient Lightsaber and Thrawn very low on health. I expect to kill Thrawn easily, but my opponent mitigated me like a champion keeping me off Force Speed specials and damage using Overconfidence, Hidden Motive and Beguile prior to Dooku finally rolling out fair. I eventually kill Thrawn and put a couple of damage into Snoke. By the end of the round, both Dooku and Talzin are getting low on health and my opponent had a solid board state. As stated before, Snoke 3 wide decks are my worst match up, but the Rebel Traitor version can be an absolute nightmare. My outs against 3 wide snoke tend to include starting on Rift and being able to steal a Snoke focus late and force my opponent to hit damage naturally and to burst Snoke down fast prior to them getting an amazing board state set up. With Snoke, dead Cienas trick becomes expensive and a bit inefficient as you no longer have Snoke’s consistency and ability to print money. Going for Ciena first is all kinds of wrong, even if they drop a Fire Spray. Game 1 – My opponent won the roll off and chose Theed. He activated Ciena and rolled a resource. With Feel Your Anger as my only mitigation that could stop him from ramping, I decided to take a chance on Talzin’s activation and was able to blank Ciena’s die with Talzin’s ability, and turn on Feel Your Anger. Rebel Traitor activated next and unfortunately for me also rolled a resource, so there was no stopping the ramp. He dropped a Fist and it did what it does best, and followed up with a round 2 Fire Spray with TLT and proceeded to steam roll me, getting off a round 2 or 3 Rebel Traitor into Mind Trick play for good measure. Though it took a few more rounds to finish, this one was decided quickly with his vastly superior board state. 0-1. Game 3 – We’re back on Theed and like in the previous game my opponent is able to ramp but is forced to play Hover Tank as his round 1 vehicle. I believe I started with a force speed and an energy bow and am off to the races. I was able to kill Snoke in round 2 I think and establish a stronger and faster board state than my opponent who was also rolling a ton of blanks of this game. I took this game and won the regional! Not to over simplify things, but in game 1 my opponent started with a Fist, and games 2 and 3, he hit neither Fist nor Fire Spray round 1 and was forced to start with Hover Tank, which against 2 wide decks is a destitute man’s Fist/Fire Spray. He’s 80% to start with a Fist or Fire Spray with a hard mulligan and I was lucky that he missed them 2 of the 3 games. To wrap things up, this was a very fun regional with very friendly people. The tournament was well organized and supported by the store (The Sentry Box) and although we only had 18 people, I feel it was a strong tournament, with all the decks in the cut being top tier decks piloted by strong players. Thanks for reading! Addressing the Cheating Allegations at the SD Regional. I feel obligated to speak on the issue both because I am fortunate enough to have a platform from which to do so, and because the event took place not just in my home region but at my home store, with a personal friend as the TO. In one match (round 3) a Truce was slipped from the bottom to the top, then a lot of shuffling happened thereafter. Prior to the Truce going to the top, cards were put one at a time from bottom to top. After Truce, cards were taken from the bottom and placed into hand then mashed into the deck after quite a few piled up. I cannot determine with absolute certainty from the video if the Truce was kept on top throughout this process but it appears so. Then a Vader’s Saber is slipped from the bottom to the top. The entire deck leaves field of view for a few seconds thereafter but every visible partial riffle leaves what is on top, on top. Cat did not cut Mike’s deck, nor did he offer to allow Mike to cut his. In the mulligan for that same match, a Friends in High Places was slipped from bottom to top and kept there after more partial riffles. Once again, he declined to cut Mike’s deck and Mike also declined to cut Cat’s. In his hand we can see the Friends In High, and he starts the round with Truce into Vader’s Saber. In one match (round 4) a Vader’s Saber and Truce were slipped from the bottom to the top, then kept on the top after a few partial riffles. Cat did not cut Justin’s deck, nor did he offer to allow Justin to cut his. In the mulligan for that same match, a Friends in High Places was slipped from bottom to top and kept there after more partial riffles. This time Justin did cut the deck. And that’s all I really needed to watch. If a sleuth wants to dig deeper into the archived footage, they are more than welcome to. During the actual tournament, both myself and the TO were made aware of the issue and looked at one of the clips (I can’t remember which one, but think it was the first shuffle against Mike). When asked for my advice by the TO, I said it was his decision but that it was very clear to me that it was a stacked deck and that I would issue a disqualification, or at the bare minimum, a game loss. The TO decided to issue a warning, at which point I advised that Cat be kept at Table 1 (as the higher fidelity of the two streams running) for the remainder of the tournament. I don’t think it should take too much convincing for anyone to reach the same conclusion I have, but because I am a numbers guy, I wanted to see just how unlikely it was that this were to occur innocently. There’s two ways to look at it. The first way is just to see how likely it is to start with the Truce/Saber combo. Ignore everything else and just look at the end result. A very quick, and very dirty way to do it is to calculate the odds of drawing at least two copies of either of the cards off of the top 10. Heading over to https://stattrek.com/online-calculator/hypergeometric.aspx put in 30 for the pop size (deck), 4 for the number of successes (assuming 2x Truce and 2x Saber), 10 for the sample size (full mulligan), and 2 number of successes (what we want). Percentage comes out to ~40%. Cut that in half because out of all 8 success conditions we calculated for, half are duplicates of the same cards and are failures in actuality. So we’re left with ~20%, decreased by the fact that we only calculated for the top 10 of the deck and not the actual mulligan process. The odds of it occurring twice in two rounds back to back are ~4%, again decreased by the fact that we didn’t calculate true mulligan odds. The second way to look at it is purely from the percentage that he happened to stop flipping cards from the bottom to the top at just the right moment. Doing it like this, it is ~6% each time. Even if we ignore the two Truces we see get pulled to the top because he didn’t truly stop until Vader’s Saber, the odds of getting 2x Saber, and 2x FIHP to the top of your deck like this randomly are 0.001296%. Straight Flushes happen in real life, and looking at the numbers is really just a waste of time anyway, done purely for my curiosity. Neglecting to offer a cut is a natural mistake that is perfectly reasonable for any player to do at some point. Stopping a shuffle on a specific card can happen. Some players learn poor shuffling habits and don’t get corrected. Sometimes when you play against Vader he does end up just blowing you out with a great series of draws because that’s what Vader is supposed to do. I am more than willing to be charitable and to assume the best of people on any one of those things. Asking me believe that all of those things happened at once? You’d be stretching my charity pretty thin. Asking me to believe it twice in a row? Sorry, I just can’t. I have to call a cheat as I see it. I don’t make accusations lightly, and I try to compartmentalize things as much as possible. I have absolutely nothing against Cat as a person. When playing against him online, and in person, he was nothing but accommodating and kind beyond any reasonable expectation even going so far as to give me a longer break in between rounds due to a chronic hand/arm pain problem I have and offering advice to alleviate the issue. I’d absolutely drink a beer with him, and I’d absolutely play against him again. I would absolutely shuffle his deck myself again too though. FFG’s casual nature as a company bleeding into their unwillingness to take action against people caught cheating and how that influences certain peoples ethical decision making. FFG’s lack of TO guidance for how to handle any issues that arise during a tournament. The expectations we have in general for tournaments ran by a volunteer player (as the TO was for this regional). What the community response needs to be when dealing with this issues. What the corrective action should be in this specific case. This is long enough so it’s best to leave most of those for another day, and it shouldn’t be too hard to guess my positions on any of those topics anyway. I’ll close this out by publicly calling upon Cat to apologize, and to relinquish the entirety of his Top 4 prizing to the person who came in ninth place at the San Diego regional. I have contact information for both players, and can act as an intermediary between the two of you. I will even pay for the shipping of the prizes. It isn’t a perfect solution and it does nothing to alleviate the disservice done to any of your opponents (especially Joe, your top 8 opponent), but it is the simplest and most direct rectification I can reasonably recommend.